Found commonly in the Kalahari dessert (Northern parts of the North Cape) going down even to the south east Free State, as well as in a much smaller, distinct part of KwaZulu-Natal (the Underberg area at the foot of the majestic Drakenberg mountains), and also in the Kruger National Park in Mpumalanga and in the neighbouring parts of the Northern Province. The Eland was likened to an ox-of-the-wild many a time, and is domesticated on a few South African farms for its high quality milk and meat. And yet, never was it's wild nature really shed, nor it's domestication complete. 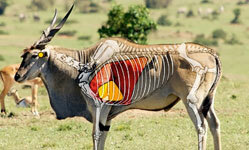 The Eland is a massive antelope, the largest of them all. It is one of the antelopes that isn't by nature full of fury and fight. 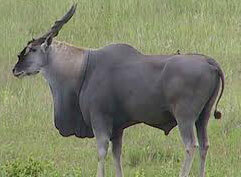 Still, the eland can move with lightning speed and can jump with surprising ease up to eight feet high. It is usually very alert and will move quickly when sensing danger. Another defensive measure often used, is to chance the direction of flight out of the blue, and, while accelerating rapidly, thus securing their safety. The eland is able to go a long way without turning to the waterhole, for it can loosen water-rich and young plants with its thick horns; plants on which they like to treat themselves.